This week has seen sectarian rioting between Catholics and Protestants in Belfast. Why does violence continue in Northern Ireland? Two men are being treated in hospital for gun shot wounds. In all 11 shots were fired - six from the nationalist side and five from loyalists. Two shots hit a police Land Rover. Police said it was "clearly an attempt to murder police officers". According to the official narrative, the ‘peace process’ culminating in the 1998 Belfast agreement was meant to lay the basis for a peaceful region in which all significant political forces, including Sinn Féin (the IRA’s political wing) would share power, by the inclusion in the political arena of representatives of paramilitary organisations, principally the IRA. The implication of the agreement was that during the ensuing periods when power-sharing has operated at Stormont, from 1999 to 2002 and from 2007 to the present, paramilitary violence should have diminished, while in the intervening ‘political vacuum’ of direct rule from London– when the British and Irish governments worked desperately to have devolution restored– violence should have risen. 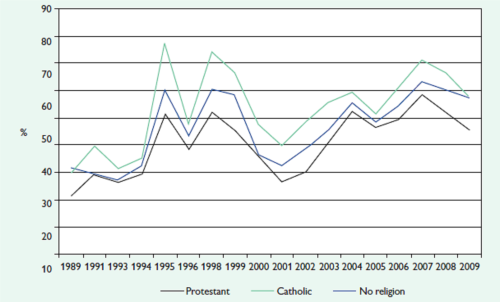 In fact, the opposite is the case, as the chart below (from Police Service of Northern Ireland data) indicates. 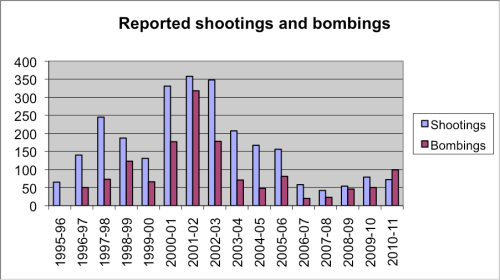 The number of shootings and bombings clearly increases in both periods of devolution, while falling in the interregnum of direct rule. Trends in public optimism about the prospects for reconciliation in Northern Ireland are a mirror image of this pattern. Analysis of responses on ‘community relations’ to the annual Northern Ireland Life and Times Survey generated the graph below. Once more, confidence deteriorates during power-sharing government and rises when this is in abeyance. These phenomena are linked by the proliferation in recent years of ‘peace walls’ dividing those working-class neighbourhoods in Belfast where politically-motivated violence has been most heavily concentrated – as at the east Belfast sectarian interface in recent nights. At the last independent count by the Institute for Conflict Research, there were 88 physical barriers of various sorts demarcating such interfaces, up from 18 before the ‘peace process’ began in the early 1990s. The explanation of this paradox is that the process addressed violence – reduced to paramilitary violence and from that implicitly to IRA violence, despite the significant contributions by Protestant paramilitary and state forces – as if it were the problem, rather than principally a symptom of it. In fact, absorbing the political representatives of one set of paramilitaries into the state will not remove paramilitarism or sectarianism. Indeed, if what happens is that the nationalistic conflict over the location of the state is imported too, then both of those phenomena may be exacerbated—as the evidence shows is exactly what has happened. The Swedish political scientist Bo Rothstein has identified the ‘social trap’ of mistrust which makes the healing of societies once fractured so difficult. Collective memories of mistrustful behaviour by the stereotyped ‘other’ become a self-fulfilling, and so self-sustaining, prophecy. Thus the 2007 NILT survey found only 10.4 per cent who disagreed with the statement, ‘If you are not careful other people will take advantage of you’. As to remedies, Rothstein highlights the importance of integrated education and integrated housing, and the rule of law. The two former were referred to in the Belfast agreement, but in the so-called ‘Women’s Coalition paragraph’ on reconciliation, which the main, male-dominated parties dismissed at the time and largely ignored once in power. In the first period of devolution, the parties failed to act on a review they had commissioned on ‘community relations’, in lieu of any policy ideas of their own. In the second they shelved a policy document issued under direct rule as well as a successor issued for consultation last year, fatalistically accepting indefinite communal division; it was withdrawn after being widely dismissed by reconciliation practitioners and independent experts. All parties to the renewal of devolution had to sign up to the rule of law. But the current first minister was convicted of unlawful assembly, having led a paramilitary-style invasion of the Co Monaghan village of Clontibret in 1986, and the deputy first minister was convicted twice of IRA membership. Neither has expressed any remorse for these activities or other paramilitary-type behaviour in which they have been involved. All they have been able to do in the face of the violence of recent nights is to announce that they would send an official to the east Belfast interface—just a few miles away from their Stormont offices—to report back to them. Indeed, it is evident that the unresolved nature of Northern Ireland’s troubled past is the Achilles Heel of what on the surface has become a stable—if also static—devolved administration. And a decade of centennial commemorations beckons from the Irish ‘home rule’ crisis in the 1910s, which will prove intensely controversial. One is the formation of the Ulster Volunteer Force—principal source of the latest violence—established by Protestant politicians at the end of 1912 to resist home rule by unconstitutional means. And more recent history is part of the explanation for the events of this week. An Historical Enquiries Team within the police is investigating crimes committed since the onset of the ‘troubles’. This may implicate UVF members who had thought they had escaped punishment when the Belfast agreement released their imprisoned confrères within a couple of years. The orchestrated rioting has been a very public way of saying ‘back off’.